Did you ever find yourself inspecting products unintentionally? Most of the time, we respond to foods and attractive objects automatically and unintentionally. Although we are not consciously aware of it, our brain responds immediately to visual triggers, thus influencing our consumption behaviour. Research in collaboration with partners in the EU-funded FOCOM consortium produced insights and technology enabling the immediate measurement of brain processes that signal the attraction to and the expected reward from foods and other products. Applegg offers services based on this technology using EEG and the registration of involuntary stimulus responses. 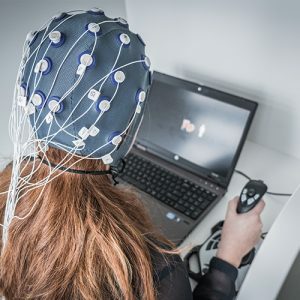 Assessments are made in dedicated EEG laboratories (up to three parallel assessments) in the densely populated and well-connected centre of the Netherlands, or on a location of your choice using a mobile unit. In combination with Applegg Online surveys, it is possible to implement Applegg Attract as a regular sized consumer study.